24 Stars for a Reward? Ever-changing Starbucks Rewards program. Earlier this year, I wrote an article which was “I predict: Starbucks Stars Earned by Dollars Spent.” I recommend the “I predict” article partly because I outlined the history of the My Starbucks Rewards program within that article. If you want to look at the evolution of the program from 2008 to present, “I predict: Starbucks Stars Earned by Dollars Spent” is helpful to read. Historically, if Starbucks is going to make big changes to the rewards, they make an announcement some time in September or October and then the changes take place later in the year or the first of the following year. September 2012, Starbucks announced that Rewards would go digital and dropped the star requirement from 15 to 12 to earn a reward. In October 2009, Starbucks announced that the first version of the Rewards program where stars are earned to get rewards. So if I had to guess, I’d say it was a glitch on the part of Starbucks to have those screens appear early on anyone’s Starbucks mobile phone app. And I’m going to make a guess: Earn a star for every $3 to $5 dollars, and 24 stars to earn a reward. My other guesses include that there will still be bonus stars for at-home coffee. Given how rapidly the Evenings stores are spreading, and that it might (in the future) take up to $120 to earn a reward, I would hope that Starbucks would consider including all the Evenings food items as eligible for a reward. Your guess is as good as mine. Thank you reader Sam for the image from your phone! The Starbucks Rewards program certainly is ever-changing! That black card in the image below (the black card sitting over the paper post card) was one of the first “Black Cards” that earned customers ten-percent off their purchases at Starbucks, in 2008). My warning here is that this is just my wild guess! Your guess is as good as mine! Edit on February 23, 2016: The official new Starbucks Rewards have been announced. Let’s Talk New MyStarbucksRewards, starting early April 2016. Starbucks announces big changes to My Starbucks Rewards. Melody, I work at an evenings store and rewards can already be redeemed for any evenings food. I got the change to my dashboard except it still has 12 stars for reward. 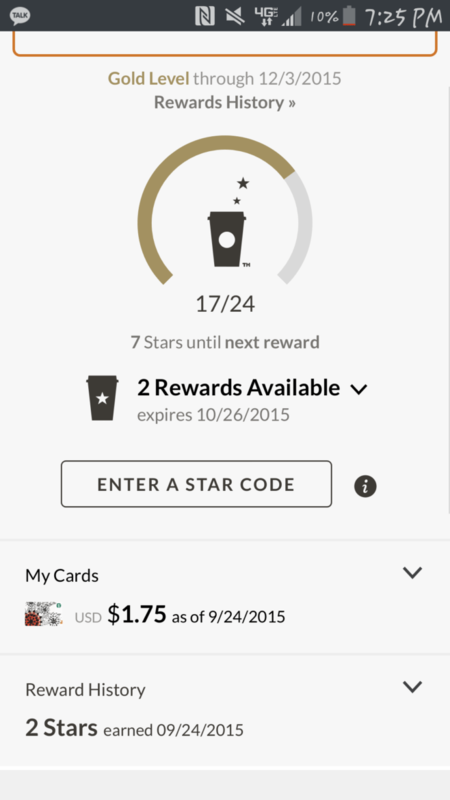 The 24 stars for a reward hasn’t shown up for me yet but nothing Sbux does or might do would surprise me anymore. Too bad if they do that, double what it takes for a ‘reward’. I think so many millions of us with registered cards have been plenty generous with the money we’ve been (essentially) loaning to them all this time. Thanks for the (possible) heads up! I haven’t heard anything about MSR changing. And trust me, we’ve been asking for a change like Melody mentioned since it launched. Having said that, I got an email yesterday telling me if I spend $7 per transaction (for a time period- a week, I think) I’ll earn 3 stars per transaction. 24 stars is a lot but perhaps Starbucks is doing a revamp of the rewards program. I think it could possibly be another level being inserted though getting the reward at 12 stars is MUCH better. Now I am curious to see what changes may be on the horizon. Off topic…if anyone has one of the first black reward cards, you can send it my way! There is a spot for it in my little Starbucks card collection! My theory is that since the My Starbucks Rewards program has been offering stars left and right on various promotion (for example, I received one where I would earn 8 stars for buying 3 specific things), the promotions have “devalued” each star. Due to this inflation, they need to set a higher bar for rewards. @BrianChow – That’s an interesting theory! I hadn’t really thought of it from that point of view. But I don’t think that Starbucks would simply increase the number of stars needed to earn a reward without some other kind of changes too – people would come unglued if one day they wake up and it’s double the number of stars to earn a reward. Interesting points to ponder. I see regular customers buying drinks for a friend or 2 and saying “I want to get the points”. I explain that it is per transaction and ring them separate. It would be nice to not have to do that. It would save time and be easier for customers to navigate the line and order/pay. Excited to see why changes are made. Just checked my SB app on my phone and I am still at 12 stars for a reward. To increase it to 24 stars without some major announcement seems odd. I wonder if it’s some type of additional level, like a beginner level. Or just a glitch. Seems like a very off glitch to happen without some legit explanation behind it. I went to go reload my gold card and mine also says I have 12/24 stars and 0 rewards available. Normally I would have a reward there for my 12 stars. I called them and they said it is still 12 stars and I have a reward but it’s not showing on my dashboard. I also got the email from them but mine said I had to spend $10 to get 3 stars not $7 like a previous poster said. I’m wondering if these changes and email specials are regionally based. If so I call BS! Not sure where anyone else is but I am in the PDX area. I will say if you now need 24 stars for a reward I’ll be getting my coffee elsewhere. It will be interesting to see what kind of changes we are in store for. I feel it is time for an update. I look forward to seeing what it is. I would certainly hope Starbucks will be fair about whatever it is. I took a look at my account. The layout has changed, but it is still showing me that 12 stars for a reward. One thing that I did notice that is different is that prior to the change in the website, it informed me that that I was ‘gold again next year’. Now, it shows that I am a “gold member” only through Jan 4th. I don’t know if that means I have to start all over again each year and acquire a necessary amount of stars before ‘gold status’ kicks in again? — what was it?… 30 stars each year. Not sure that means anything because I have been a gold member for years now so I guess we must wait and see. I just fullfilled my 24/24 today for a reward and praying it is a glitch. On a happier note starbucks announced the holiday issue starbucks cards like last year. This year there will be 48 cards and not the 99 but there will be three new $200 cards with $50 preloaded like last year. Thank you as always ms melody. I agree with your theory that in future, stars will be tied to a set dollar amount. But still, if each $3 earns a star, and you need 24 stars to earn a reward, you are looking at a $72 expenditure before you get your freebie (or more if the set dollar amount turns out to be $5!) That seems like a chintzy return to me, and not a great incentive to keep pre-loading my Starbucks Reward card. I’m kind of thinking that this is some sort of glitch with the Android version of the app since it was just released. I don’t think Starbucks would make a drastic change to the rewards program like this without first announcing it. I have heard rumors that customers will soon earn multiple rewards per transaction (like everyone has been asking) to help eliminate the ringing everything up separately things that happens all the time. We’ll see…. @David – I think that’s a fair guess as well. For people who already really do spend a lot at Starbucks, this new system would be more fair. And it would be fairer in the sense that everyone would be spending the same to get to a reward (for the most part, absent bonus star promotions). Either way is fine by me! But yes, it could’ve totally just been a strange glitch related to the release of the android app. I just checked my app and it still says 12 stars for a reward. I think earning 24 to get a reward is a lot, but I guess it would even out if the stars are awarded on purchase amount and not per transaction. You guessed that people would have to spend at least $3 to get a reward, but what would happen if you spend less? Some days all I get is a tall iced coffee, which costs me $2.25. I’m not really wanting to spend extra just to get a star, especially when it’s iced coffee and I’d be sitting in the store anyway and can get refills anyway. Off topic, I am 16 stars away from fulfilling my Gold card requirements and I only have until sometime in the first week of October to do it, which means it’s not going to be done as I don’t have the money for 16 transactions. But I wanted to know what happens when I don’t hit that requirement? Do I just go back to green and need to restart in getting 30 stars in the next year to get back to Gold? So interesting! I wonder if they really ever changed it to 24, if it would become per item. It would incentivize those to spend more, or those who already spend more in a transaction….but those who just buy one thing would feel a little jilted I’m sure. PS – I like Sam’s card thumbnail, though I can’t place the design of it. I’m not sure if I would change my habits much if they changed the rewards. I’m a basic brewed coffee drinker, who uses my rewards for breakfast or lunch as a treat. The individualized marketing does draw me in at times, mostly when it’s bonus stars for breakfast / lunch sandwich, or a star dash. Plus I usually buy my Whole Bean coffee at the grocery store when it’s on sale, and I save those Star Codes for as long as possible, so I can redeem them for bonus stars like the 8 stars I got last week. If the earning level goes to 24 stars, maybe the rewards limit will increase as well. I’d trade 12 for 24 if I could get Whole Bean coffee as a reward instead of just food or beverage. Meanwhile, it’s fun to speculate! Hmmmm… Whole bean coffee as a reward. Or K-cups, etc… Now I LIKE that! @jv was absolutely correct with the info. Seems like it was a glitch but like ms melody stated it may signal what is to come. Hopefully the system will become better. @julie yes, sadly. If you do not get 30 stars again in your calendar year you get bumped down to green level again. You will have to become a gold member all again. Now I would say this reply sounds very PR. It disregards the issues of whether the rewards are changing. Though it’s hard for me to read tone of voice in an email – I don’t really know the person it came from. But it makes me a little more sure that reward changes are coming… Time will tell! Hope you’re doing well and have enjoyed your week. 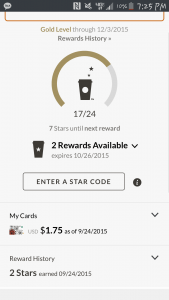 Speaking of weird Starbucks rewards things, does anyone else have multiple Gold Level ending dates? @Hayley – I believe Sam’s card thumbnail was this year’s Mother’s Day card (the one that came pre-loaded and packaged with a paper card). Yes, I noticed it right away. I mentioned it earlier (above). I’ve been gold for years, but seems my gold status ends Jan. 4th. I wondered if this meant that you must obtain 30 stars BEFORE any bonus stars or promotions are offered. … just wondering outloud. @Lee – Is your date different on the website vs the app (if you have one)? As far as I know, as long as you get 30 stars every year before your anniversary date, you stay gold. On Jan 4th, the system should just check if you’ve received 30 stars in the previous 365 days and if you have, you’re golden (for another year). I do not have an app, only the card. Prior to the website change, it informed me that I was ‘gold’ next year, too as I fulfilled my 30 star quota for the year. Today it informs me that I’ve been a gold member since 1-8-11, but gold only until 1-4-16. Odd. I had my husband check his as he would be gold going forward. His informs that he has been a gold member since 11-2-14, but the he is gold only until 11-1-15. (at least his dates make ‘line up’). I am not concerned about it, as we each have fulfilled our obligations as stated in the rules. I just found it curious and was wondering about it outloud as well. I do not understand those who complain about those who ‘swipe’ more than once or use different cards to pay while in line. Really, how long does it take to swipe a card twice? You must wait in line for your item to be prepared anyway. I bring it up because often when I go, I go with a friend. She gives me her card while she scouts out a place for us to sit. I place my order using my card and then place her order using her card. There are those who really feel a need to complain about that? They are not going to get their order any faster. Who cares if someone swipes more than once. Update: My account is now showing 12 for a reward again and I did get my reward. I do think it will be implemented at some point. Enjoy 12 while you can! @LisaWaller and @ChrisW – That’s a great thought. If this changes so that it takes 24 stars to get a reward, why not add in at-home coffee (excluding Reserve coffee) as a reward!! @Meloday and @LisaWaller and @ChrisW – Agree. In-home coffee would make for a great reward. ** For now, I would be so pleased if Starbucks just awarded bonus stars for grocery K-cup purchases. It wasn’t just an app glitch. People were seeing it when they logged into Starbucks.com. I’m now really convinced this is a change … coming soon! Thank you for always providing relevant Starbucks information, Melody. We’ll wait and see how this plays out. On another note, I’m excited for the new Starbucks cards! @Melody… that seems ridiculous that you could not transfer the balance. What is the goal in that, except maybe Starbucks is thinking if you are toting that fancy card around others will see it and want one, too. Personally, I have not bought any of them. A little to pricey for my budget. Even if I could I would want to keep it pristine, so if I can’t transfer the balance to my well-loved Gold card I doubt I’d want one, either. Hmmm… but as I’m thinking about it, couldn’t you use it as a registered card on the phone app? Then the card would stay in nice condition. Lee, for two drinks the separate swipe isn’t a big deal, but I have customers sometimes that want 7 or more things rung in separately. That takes up a lot of time and slows down the line quite a bit. I would imagine that if the threshold goes up to 24, the value of each star will go down as well so we wont be losing anything. I’m hoping each star is earned from a dollar amount because then the program will be fair for all customers. Melody, your contacts are well informed! I haven’t seen anything about holiday yet! Very interesting! I have not heard anything, but it wouldn’t surprise me if they revamped it in January when they do the big MSR registration drive. @Melody – Wow, that is rather unfortunate. I haven’t bought an expensive card yet, but if I did, I wouldn’t want to scratch it/pass it through the register. Has Starbucks publicly announced the cards in general? Through what website? @Thomas None of this Starbucks holiday /premium card info has been released to the public yet. I’m just telling you what a few partners are telling me. All I know is that I won’t jump into a premium card. I want to see how this transferring of funds thing works out. If you register the card, that means scratching the pin, which makes it less pristine. I like the idea of just linking and using the premium card on your phone. Then you’re not damaging the card of you can’t transfer the balance! The last premium card we sold had a barcode that was scanned by the reader, and not swiped, so I’m imagining that these new ones will as well, so cards will be able to stay intact! That being said, I don’t see the reason why funds can’t be transferred off, unless it has something to do with the fact that this card itself cost money and could be returned, whereas other cards cannot be? I’m in the UK for several weeks and noticed today that the UK website says you need to earn 50 stars in 12 months to qualify for Gold. I’ve been a Gold member for years, but have only ever needed 30 in 12 months to keep my Gold status, and my Android app says I need 19 (out of 30) more stars to qualify. Are the requirements different in different countries? Starbucks may say it is a glitch.. But here it is the 1st of october and once again my screen shows 13/24 needed again for a reward. A sign that something may change in the near future. I sent you an updated screenshot. Thank you for all your wonderful info. Thanks for this info! If Starbucks does in fact up the required stars to 24, I will definitely be finding another place to purchase my coffees on the go! I’m trying to add my Starbucks gold card to Teavanna so I can get rewards when I buy online and it tells me my card number is invalid. I know for a fact that it isn’t because it’s the only card I purchase with and I’m reading the number directly from the card. Am I doing this wrong? Just got an email about official changes for April 2016. Now it’s indeed going to be based on dollars spent, and $62.50 equals a free reward of your choice (which they explain as 2 stars per dollar, and 125 stars per reward… divide 125 by 2 stars = $62.50). If you compare $62.50 per reward to 12 purchases per reward, you only benefit if your average purchase before this change was $5.21 ($62.50 / 12 = $5.21).